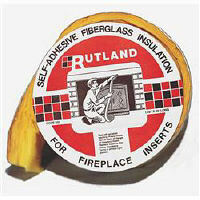 1-1/2" wide insulation strip with a peel-off, self stick back. Forms a smoke and gas tight seal between fireplace and existing masonry. Makes it easy to get a smoke and gas tight seal when installing the fireplace stove or re-inserting the fireplace stove back into the fireplace after chimney cleaning. Also for use with fireplace doors. For best stove performance, replace insulation each time insert is removed for cleaning. Has a service temperature of 1000°F.